We found this great recipe on the website, Gimme Some Oven. 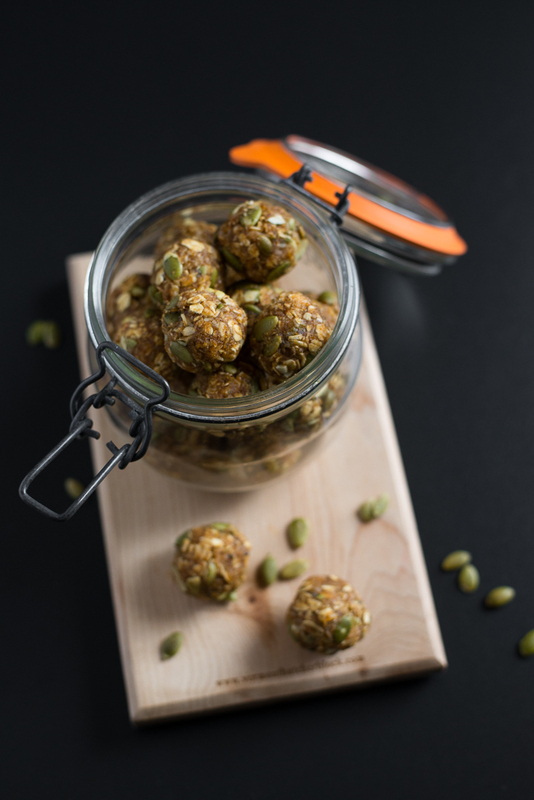 This is an easy “no bake” recipe which is perfect for a quick, energy dense snack. They work great in lunchboxes too. They are sweetened with dates and honey and I would recommend eating just one or two since they do pack a punch. What I love about these is the great flavor you get from so many fiber and phytonutrient-rich ingredients. The flavors are earthy and comforting and the texture keeps your mouth guessing! We love the idea of refueling your body with whole foods. Kids will love getting their hands messy and helping shape the bites. Combine the dates, honey, pumpkin puree, chia (or flax) seeds, cinnamon, ginger, and nutmeg in a food processor, and pulse until smooth, scraping the sides down occasionally to combine. Transfer the mixture to a large bowl, and stir in oats, coconut, and pepitas until evenly combined. Cover and refrigerate for at least 30 minutes. Once the mixture is cool and easier to work with, use a spoon, cookie scoop or melonballer to shape it into about 1-1.5 inch balls and then use hands to shape even further. Alternately, you can line a small baking pan with parchment paper, and press the mixture evenly into the pan, let it cool and cut into squares. Can be stored in an airtight container in the fridge for 1-2 weeks.